Marketwire: Ontario government will contribute a maximum grant of up to $24.3M to support DALSA's imaging technology R&D at the company's Waterloo facility. The grant is to be paid over a period of five years. The Record: On the same day DALSA executives hosted a picnic to celebrate the company’s 30th anniversary. The company employs nearly 1,000 people around the world, about 300 of them in Waterloo. Seeking Alpha: Micron Q3 2010 Earning Call mentions that: "Revenue from our foundry like model with Aptina was $92 million, reflecting a 15% increase compared to the second quarter." Toshiba has developed a quarter video graphics array (QVGA) (320 x 240 pixels) uncooled infrared radiation image sensor that achieves a noise equivalent temperature difference (NETD) of 0.25 K. As this sensor can detect a person in the dark from the image of the temperature distribution by sensing far-infrared radiation emitted by the skin, it is applicable to many areas including pedestrian detection sensors for automobiles, human detection sensors, security sensors, and so on. 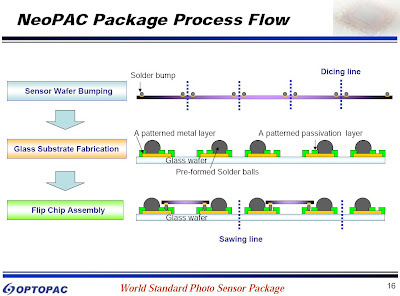 In order to increase the resolution, or the number of pixels, we have utilized a microelectromechanical systems (MEMS)-based process to reduce the pixel pitch from 32 µm to 22 µm, which realizes a QVGA image sensor of the same sensitivity and chip size, and decrease the read-out circuit noise to improve the NETD from 0.55 K to 0.25 K.
Update: The full paper in Japanese is here. "The typical thermal budget for the epi layer growth and front side CMOS processing causes diffusion tail to grow 1.5 to 2.0um into epi layer 410. 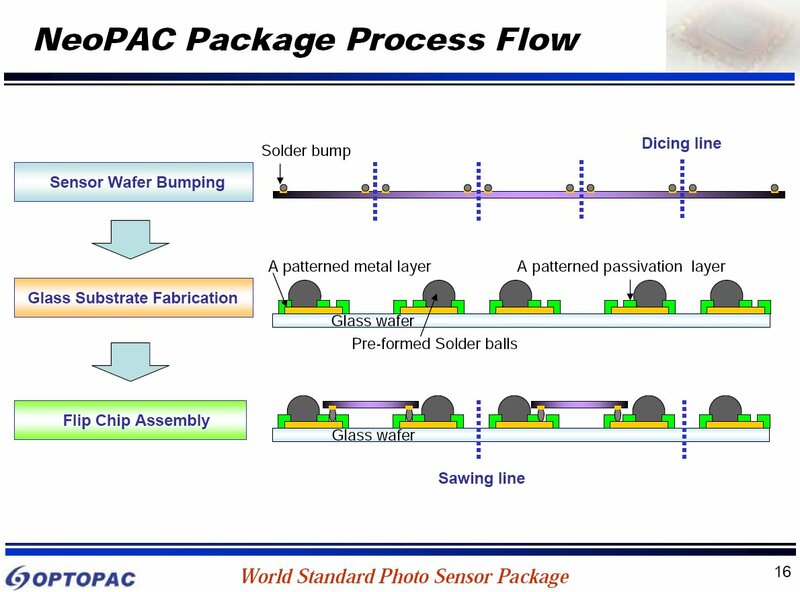 Conventional image sensor fabrication techniques start with an initial epi layer thickness L3 of approximately 5um or greater to provide adequate sacrificial space within the bottom portion of epi layer 410 for diffusion tail to be completely removed. Embodiments of the technique disclosed herein may start with an initial epi layer thickness L3 of approximately 3-5um (in one embodiment L3 is selected to be 4um). In these embodiments, epi layer 410 is thinned to a target thickness L1 of approximately 2.0-2.3um for epi layer 410 and a target thickness L2 of approximately 0.5-0.8um for dopant gradient band 405. Accordingly, the initial thickness L3 of epi layer 410 is selected such that diffusion tail migrates upward to within 3.0um or less of the top surface of epi layer 410, and in the illustrated embodiment to within 2.0um of the top surface of epi layer 410." Xconomy: SiOnyx has raised $6.3M out of a planned $12M new round, as reflected in its recent SEC filing. Chipworks published iPhone 4 teardown report and identified its 5MP BSI sensor as made by Omnivision, likely part number is OV5642. The pixel size is 1.4 µm and the sensor is manufactured at 130 nm process generation. "The sensor in the iPhone is believed to be the OmniVision 1.7 as disclosed by Apple. We made an error in our post describing it as 1.4 and have fixed it. We are expected to have the camera module in our RE labs today and will fully confirm the device. (It was torn down in California)." "The phone's front-facing five-Mpixel camera is either the OV5650 or the OV5653 based on specifications and preliminary die photos inspection. The image sensors have appeared in handsets the group has examined, however it is a relatively modern choice compared to image sensors in past iPhones, and it supports backside illumination. 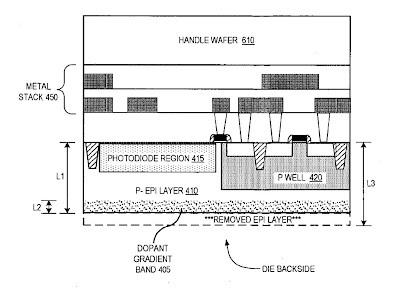 "Typically Apple uses older image sensors to save a few dollars," said Steve Bitton, a product manager with UBM TechInsights working on the iPhone 4 teardown. 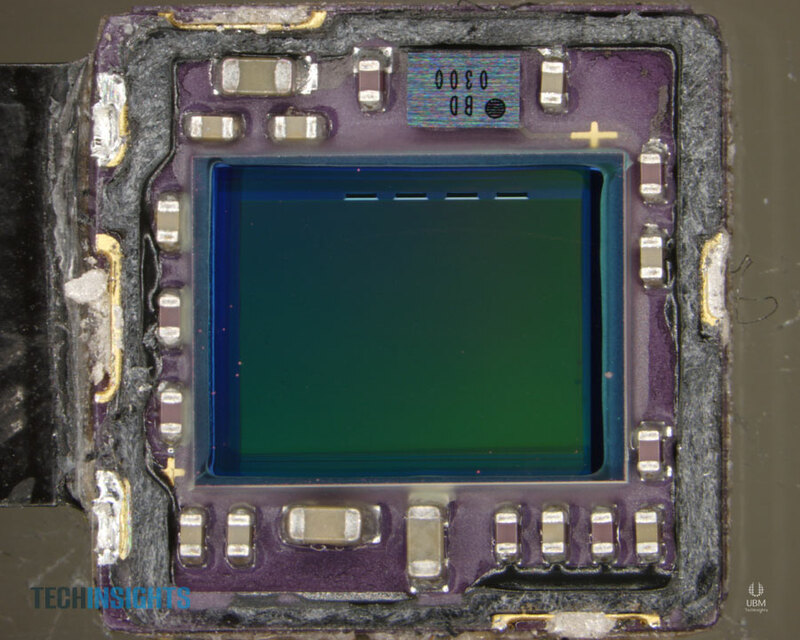 "By examining the image sensor package and by comparing the die photo and specifications to our die image library, we have identified the 5 MP image sensor as the Omnivision OV5650 with backside illumination technology." PR Newswire: SiOnyx in collaboration with the Army Research Office (ARO), has successfully demonstrated pixel-scale detectors with room temperature Detectivity (D*) exceeding 1x10(14) Jones. This number basically says that the noise equivalent power is 1.0e-14 Watt for a detector having 1 sq. cm area and 1 Hz bandwidth. At 1um wavelength the energy of photon is 1.24 eV or roughly 2e-19 Joules. So SiOnyx figure means that SNR=1 is achieved at about 50K photons/s flux in 1 sq. cm area detector at a speed limited by 1 Hz BW filter. Nice number. 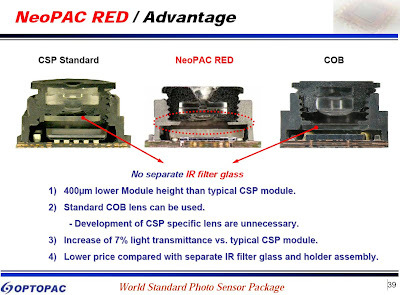 This is said to represent a full 10x improvement over traditional silicon detectors. This paves the way for SiOnyx to participate in new sponsored research programs with the Army Night Vision and Electronic Sensors Directorate (NVESD) and Defense Advanced Research Projects Agency (DARPA). 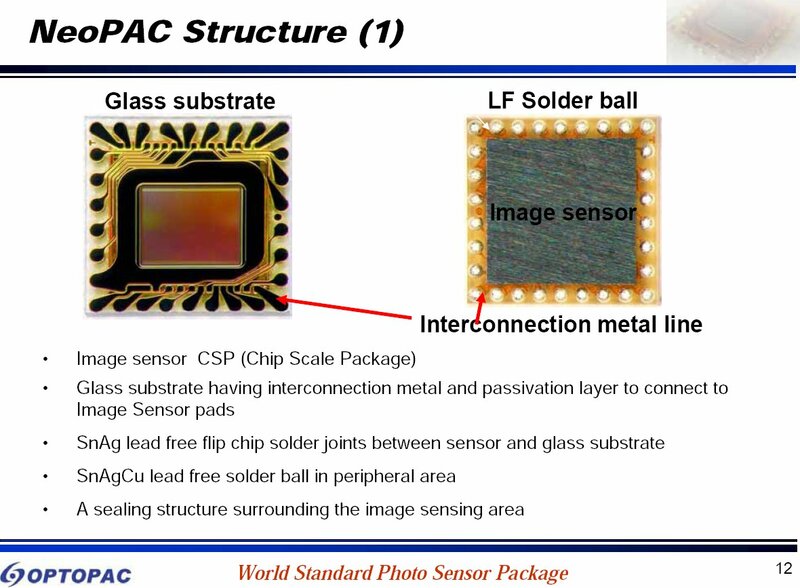 PR Web: Forza Silicon announced that it is in a joint development effort with a leading image sensor foundry to bring to market the next generation of HDR CMOS image sensors. Forza demonstrated an image-aware tone-mapped image set in its labs in Pasadena, California, which represents a close approximation of how a natural scene looks to the human eye. I'd guess that Forza's foundry partner is TowerJazz. PR Newswire: Altera continues to develop its FPGA-based WDR camera platform and now presents a complete reference design for surveillance cameras on a single FPGA. The design uses Altera's low-cost Cyclone III or Cyclone IV FPGAs and IP from Eyelytics and Apical supporting AltaSens' 1080p60 A3372E3-4T and Aptina's 720p60 MT9M033 WDR sensors. Traditional ISPs and ASSPs don't have the processing power required to accept the large bandwidth of data from 1080p and 720p WDR CMOS sensors (for instance, a full HD raster is 2200x1125 pixels x 16+ bits per pixel x 60fps, resulting in >2Gbps bandwidth). Apical's spatial dynamic range-compression (local tone mapping) algorithm, known as "iridix"
Apical's 2D noise-reduction algorithm, known as "sinter"
EETimes, Digitimes, IC Insights: With demand for digital cameras, camera phones, and machine-vision systems recovering, sales of image-sensor devices are forecast to grow 31% in 2010 and will reach a new record high of $8.5 billion after falling 19% in 2009, according to IC Insights' new 2010 Optoelectronics, Sensors, and Discretes (O-S-D) Report. 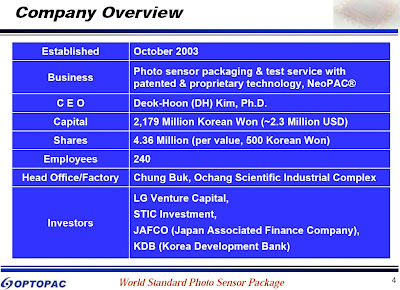 The 2009 decline was the worst suffered by image sensors since the 2001 semiconductor recession, when this optoelectronics market segment fell 24%. 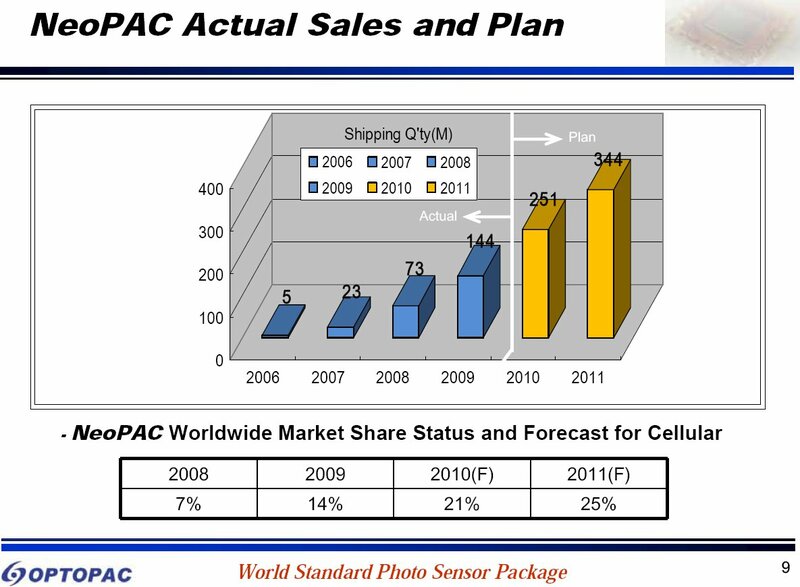 The projected 31% rise in 2010 will be the greatest annual sales increase for image sensors since 2004, when the market surged by 76%. Worldwide image sensor growth continues to be driven by applications for CMOS-based devices, which will account for 61% of sales in the market this year compared to 39% coming from CCDs. 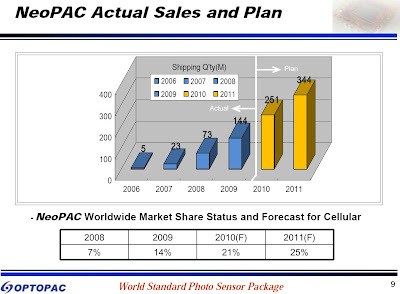 The new report's forecast shows CMOS image sensors sales rising 34% in 2010 to a record-high $5.2 billion from nearly $3.9 billion in 2009, when revenues fell 16% due to weak demand in the economic recession. Between 2009 and 2014, CMOS image sensor sales are projected to increase at a 17% compound average growth rate (CAGR), reaching $8.3 billion in the final year of the forecast period. Meanwhile, CCD image sensor sales are forecast to rise 27% in 2010 to $3.3 billion after falling 24% in 2009 to $2.6 billion. CCDs, which continue to dominate digital still cameras, video camcorders, scanners, and other machine imaging applications, are expected to set a new sales record in 2011, when dollar volumes reach nearly $3.7 billion and exceed the current annual peak of $3.5 billion set in 2006. IC Insights' 2010 O-S-D Report shows CCD sales growing at an 8% CAGR in the five-year forecast period, reaching $3.8 billion in 2014. PR Newswire: Omnivision introduced a VGA sensor that can capture video at 60fps, enabling smoother motion video, as well as improved accuracy for motion detection applications. 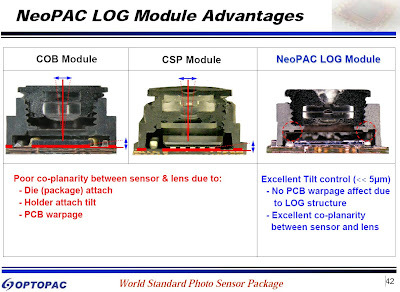 The high-speed OV7735 VGA sensor fits in less than 3mm thick camera module. The OV7735 is built with 3um OmniPixel3-HS and achieves a sensitivity of 3300 mV/lux-sec. The power consumption is 100mW under normal operating conditions. 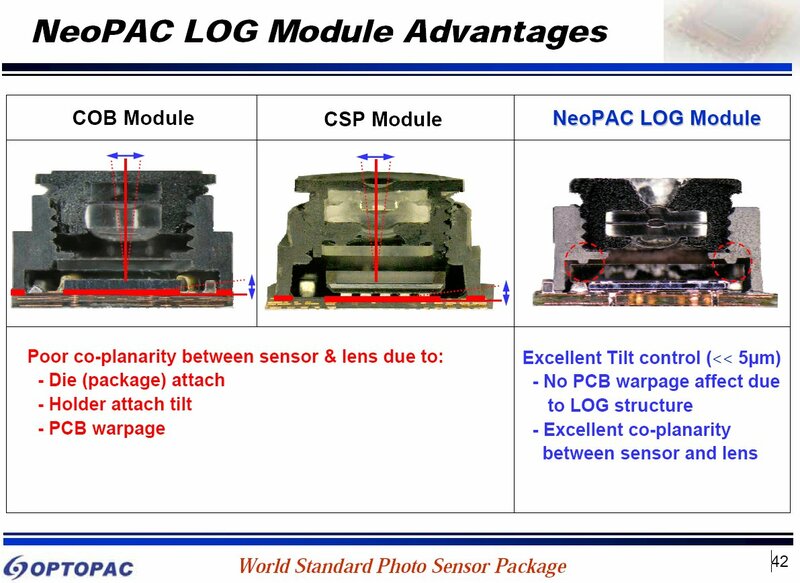 All required image processing functions, including exposure control, white balance, and defective pixel detection and correction are programmable through the SCCB interface. The OV7735 is sampling now and is expected to enter mass production in August 2010.
Business Wire: Canesta is using TowerJazz’s CIS process to manufacture its CanestaVision 3-D image sensors. CanestaVision chips are the single-chip 3-D image sensor SoCs for use in consumer desktop computing, TV and entertainment applications. “Canesta’s solution is the most robust in the industry, offering the best performance compared to any other competing solution. The very tight R&D collaboration and roadmap alignment between our two companies provides near and long term innovative solutions that will further improve performance and power consumption in future generations and will allow wins in many more applications, such as the mobile computing area,” said Dr. Avi Strum, VP and GM of Specialty Business Unit, TowerJazz. Globes sources estimate that the deal will add $200-300M in annual revenue to TowerJazz. While we are at ToF news, Softkinetic, Optrima and Metrological Media Innovations announced a partnership to offer set-top-box and television manufacturers an integrated 3D gesture-based solution. Mediaconnect TV, a hybrid consumer TV entertainment platform based on Intel CE Media Processing technology and powered by Metrological’s Metroconnect OS adds 3D gesture-based interfaces to its rich set of functions. The commercial deployment of Mediaconnect TV begins in Europe in the coming weeks and is expected to begin in North America by fall of this year. Avnet published a video of Toshiba ImaTuning platform allowing tuning and calibration of Toshiba image sensors. Photonics Online: e2v CCD was launched into space onboard the CNES (Centre National d'Etudes Spatiales) microsatellite Picard, on its 2-3 year mission to study the Sun. The CCD42-80 sensor is a frame transfer matrice of 2048 x 4096 pixels, 13.5-µm square pixel size, with back-thinned illuminated technology. It works in UV light and in the MPP (Multi Phase Pin) mode. This mode, associated with a temperature regulated at -40° C, reduces the dark currents to a very low level. The sensor also has high quantum efficiency in the spectral range (370 nm, 950 nm). "Reducing the silicon thickness introduces process complexities in terms of laser annealing the backside dopant layer. ...the temperature rise at the front surface will be greater for thin silicon. 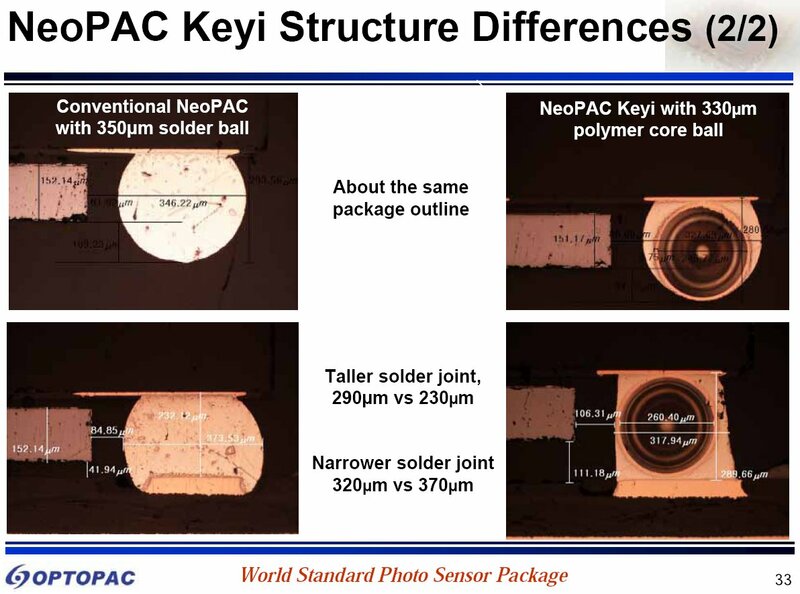 Accordingly, in some embodiments, a laser anneal mask (not illustrated) is deposited on the die or wafer backside and patterned to only expose those areas immediately below PD regions 415. When the annealing laser is scanned across the die or wafer backside (see FIG. 6C) only the uncovered portion of dopant layer 405 is exposed to the laser, so only the boron in this exposed area is activated. The thickness and composition of the laser anneal mask are laser and process dependent; however, the composition and thickness should be chosen to have a high reflectively to the laser wavelength. Masking the die backside prior to the laser anneal of dopant layer provides a number of advantages. The amount of energy absorbed by the silicon is reduced, thereby reducing the temperature rise of the die. There are typically no metal/silicide contacts above photodiode region 415 and therefore the front surface can tolerate a larger temperature rise than regions with metal contacts. Metal contacts will typically degrade above 400 C, but dopant profiles typically do not diffuse below 800 C. The periphery circuit around photodiode region 415 and pixel array is protected from the harmful effects of the laser anneal process. The P+ type ion implant under the masked back surface area is not exposed and therefore is not activated creating a high recombination region. Electrons that migrate to or are formed in this region will recombine easily reducing crosstalk." There is also "a backside surface treatment layer is applied to further passivate the backside of epi layer and cure surface defects... 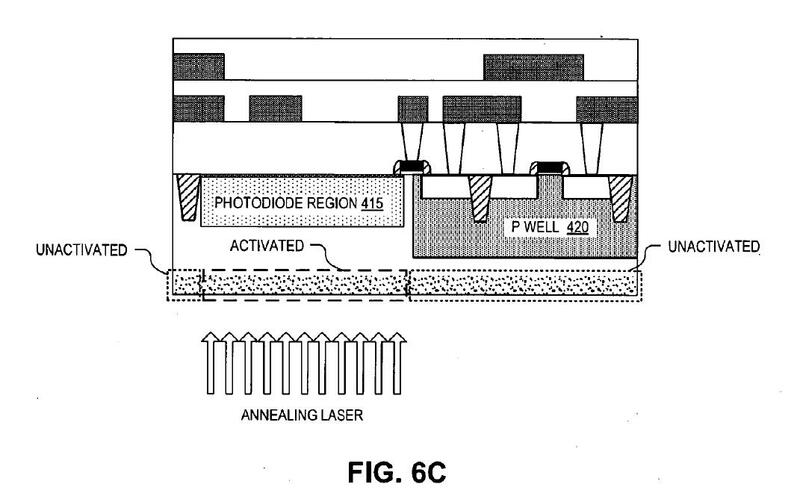 Surface treatment may include exposing the backside silicon surface to a gas or liquid containing a reducing or oxidizing species to reduce backside surface states. These species may include H2, H2O, N2O, O2, O3, and H2O2, among others. 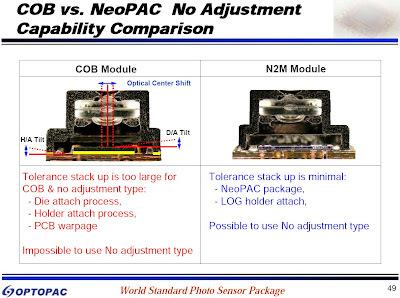 Curing defects and reducing surface states advantageously can reduce dark current and white pixels." Optrima reports that US Secretary of State Hillary Clinton tried its Optricam 3D Gesture Control camera at the US Pavilion at the Shanghai World Expo 2010 on May 22, 2010. The camera was a part of General Electric X-ray simulator in the US Pavilion. Engadget published fairly detailed review of Microsoft Kinect, which is the new name for "Project Natal" gesture recognition for Xbox360. Albert Theuwissen explains PRNU effects on PTC measurements. The PTC series of articles becomes more and more complete. Thanks to B.M. for sending me the link! "The company has changed its business model during the economic downturn of 2009 and finances itself by commercializing its FCP (selling non-exclusive licenses to strategic partners). The funds are used for the development of new CIS technologies and products." "The company is developing new generations of the FCP technology that pave the way to sub micron pixel size with excellent image quality. 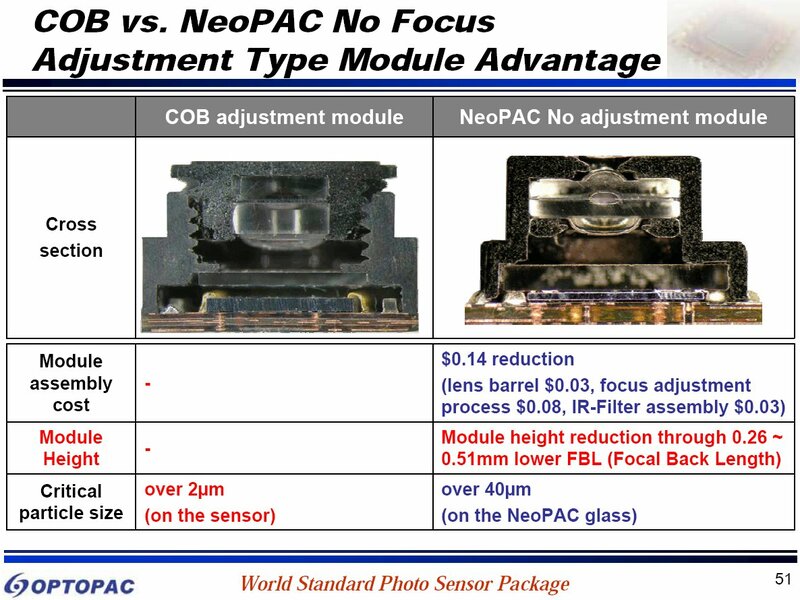 A 12Mpixel imager with 0.9u pixel size can be housed in 1/4" optical camera module – the same physical size used for a 5Mpixel 1.4u pixel imager." PR Newswire: Hynix licenses UK Apical's iridix and sinter image processing IP cores for future Hynix image sensor products. iridix IP provides DR correction based on original research into the way the human eye adapts to different lighting environments. iridix gives natural-looking still images and video without need for additional post-processing. 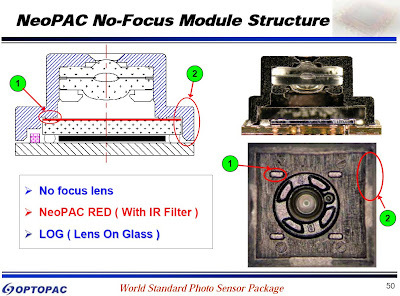 Apical's iridix has formed the basis for many well-known product features in DSLRs, compact cameras and mobile phones. The iridix version 7 IP core combines professional/broadcast -level image quality with compact, low-power hardware implementation suitable for any digital imaging device. sinter is a state-of-the-art noise reduction core which addresses the primary noise sources affecting image quality in CMOS sensors. Originally developed for DSLRs, it has been further developed to tackle the particular noise characteristics of compact high-megapixel sensors used in mobile phones. Digitimes: Optical touch vendor NextWindow expects that optical touch will become a standard specification like webcam for all-in-one PCs and LCD monitors when the price for dual-touch optical touch panels drops to US$1 per inch. Current quotes for optical touch solutions are US$2 per inch for dual-touch panels (US$1 per inch for single-touch ones), much lower than those for projected capacitive solutions staying at US$4 per inch, according to Geoff Walker, marketing evangelist and industry guru for NextWindow. Quotes for dual-touch optical touch panels are expected to drop to US$1 per inch in 2-3 years. The company shipped about 750,000 optical-touch panels in 2009, 70-80% of the touch-function enabled Windows 7 products in 2009, and NextWindow expects to account for over 70% of the market in 2010 amid limited competition. 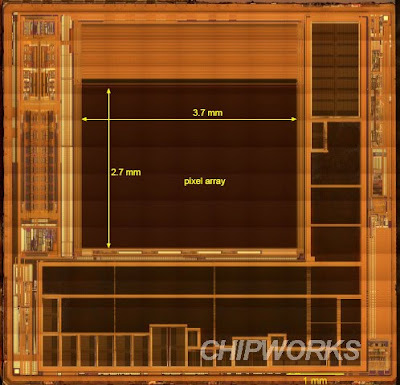 i-Micronews: Steve Jobs announced that the next generation iPhone 4 will have 5MP BSI sensor based on 1.75um pixels. The sensor also supports 720p/30fps HD video. CNet speculates that the sensor is made by Sony, and that HD video in iPhone can affect Cisco Flip camcorder sales. PR Newswire: Omnivision introduced a complete 5MP SOC camera solution aimed at the high-volume AF camera phone market. Built on OmniVision's 1.4-micron OmniBSI technology, the new OV5640 is optimized to offer a cost-effective, complete camera solution for still photography and 720p/60fps or 1080p/30fps HD video in camera phones. The 720p/60 HD video is captured in full field of view with 2 x 2 binning. Additionally, a unique post-binning re-sampling filter function removes zigzag artifacts around slant edges and minimizes spatial artifacts to deliver even sharper, crisper color images. "Industry analysts predict that one-third of mobile phones will employ cameras with 5-megapixel resolution by 2012. Consequently, there is an increasing need for performance worthy of a 5-megapixel camera at cost levels that meet the requirements of the mainstream market," explained Vinoo Margasahayam, product marketing manager for OmniVision. The OV5640 is available in CSP, RW and COB packaging options and is sampling now. It is expected to enter mass production in the second half of 2010. PRNewswire: Qualcomm makes a strategic investment in Anteryon as part of its European investment fund. Qualcomm Ventures Europe is leading this round, with BNP Paribas Private Equity and Biggell Finance participating as existing shareholders, and Quest for Growth, a Belgium-based investment fund, also as a new investor. Terms of the investment have not been disclosed. Anteryon's WaferOptics product portfolio is ranging from VGA to 5MP, and manufacturing facilities in Eindhoven and China that produce millions of WaferOptics lens stacks monthly at an extremely high yield for several top-tier mobile phone manufacturers around the globe. "This new investment will enable us to boost our worldwide manufacturing facilities, including extension of the facilities in Eindhoven and the set up of a new state of the art production facility in the Far East. In order to meet the high-volume market demand, we will also investigate additional ways of scaling our business, such as partnering with other players in the supply chain and/or licensing our technology," said Gert Jan Bloks, CEO of Anteryon. The phone also contains a second camera equipped by a more conventional Omnivision 1.3MP FSI sensor. • Side fill and holder attach. Thanks to Peter Elenius for sending me the presentation! Business Wire: Aptina launched the MT9M114 720P/30fps HD video SoC. The new Aptina 1/6-inch SoC enables low profile camera modules to easily meet thin sub-4mm height specifications and is able to deliver 60fps when summing in VGA mode. The sensor is targeted to netbooks, notebooks, monitors, televisions, and other applications using embedded web cameras. The sensors’s 1.9um pixel rivals the performance of a 3.6um pixel. The SOC provides a unique perspective correction feature to reduce the need for physical camera position adjustment. It also features weighted average exposure, adaptive backlighting, and 3CCM Auto White Balance. The MT9M114 is available in CSP packaging and is presently sampling with availability in mass production in calendar Q3 2010.
Business Wire, EETimes: Cypress 25MP VITA 25K 53fps sensor claims to offer the market's highest throughput for a device with a pipelined and triggered global shutter. The sensor has 32 10-bit LVDS outputs, each runs at a 620 Mbps, which results in a high frame rate of 53fps at full 25MP resolution. The sensor is intended for high-end machine vision applications, such as inspection machines; biometric inspection, such as next-generation palm print readers; and intelligent traffic systems. The VITA 25K sensor has 5120 x 5120 active pixels with 4.5um pixel size. The sensor's datasheet gives few more details: The pixel fill factor is 80% and FF x QE is 52% at 550nm. FPN is 0.5%rms of the full scale. PRNU is 2%. Dark current is 133e/s at 25C. The power dissipation is 2.5W out of a triple supply (1.8V, 3.3V and 4.5V). 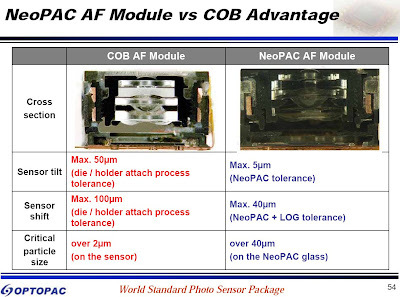 Its ADC has 10 bit resolution. The sensor offers a 35-mm optical format with monochrome or color digital output. 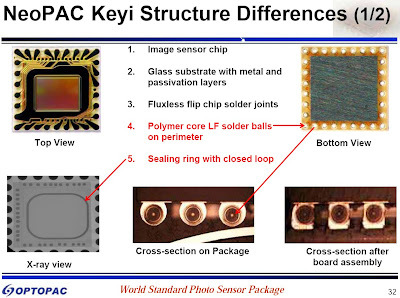 Samples of the VITA 25K image sensor are currently available, with production devices expected in the first half of 2011. This video was initiated by NASA's Hallmarks of Success project to document various successful tech transfer stories. 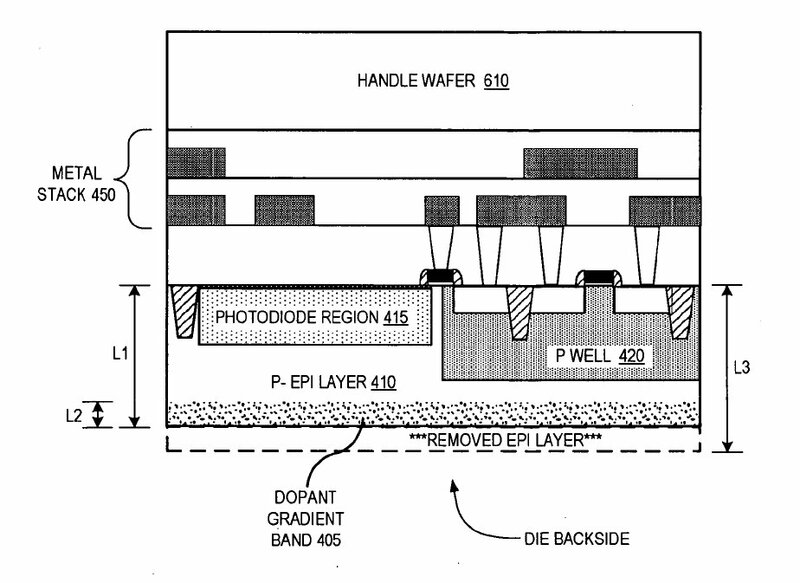 The main tech transfer path was JPL->Photobit->Micron->Aptina so that is why Aptina features so prominently. Roger Panicacci was a key chip design engineer in our group at JPL, a founding member of Photobit, and now a big honcho at Aptina and it was great to see him in this video (hey Roger!). Besides Roger and me, the B&W JPL photo also shows Bob Nixon (retired), Barmak Mansoorian (now President of Forza Silicon), Bedabrata Pain (at JPL until recently - now in the Bollywood business), Orly Yadid-Pecht (now a Prof. in Calgary, I think), and others. Missing are team members Suni Mendis, Sabrina Kemeny, Junichi Nakamura (a Distinguished Visiting Scientist at JPL) and also Marty Agan who was a communications engineer at JPL and worked with us on a miniature wireless camera. I am sure I am forgetting other people known to readers of this blog and sorry about that. I was not involved much at all in the making of this video and I can't say the video is 100% accurate, esp. 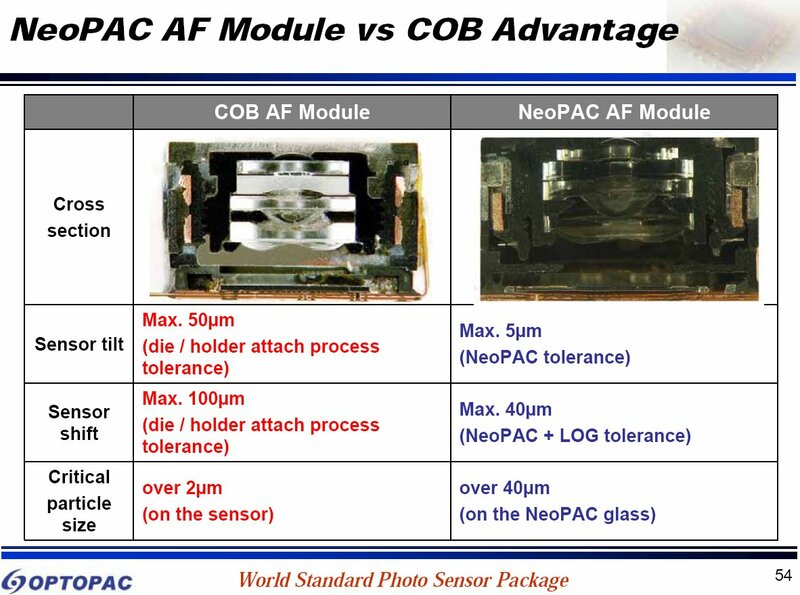 as it is not aimed at image sensor technologists. 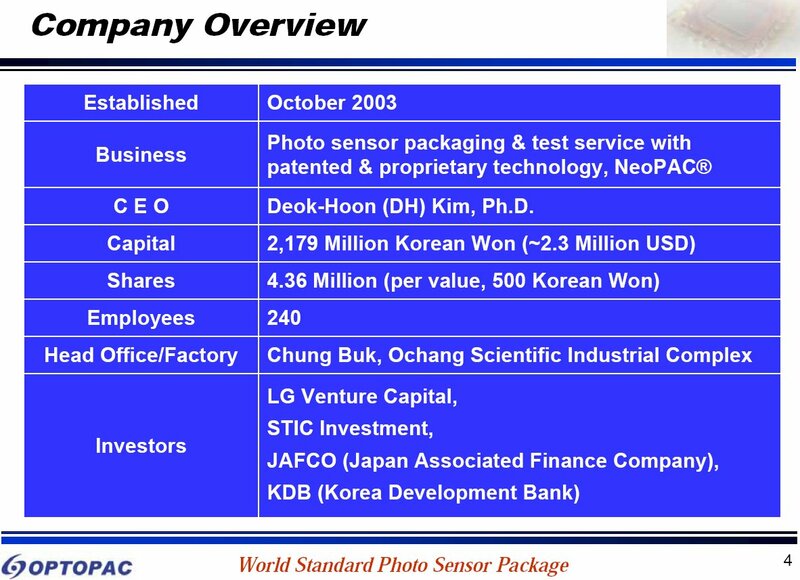 It would have been good if it had mentioned other companies that licensed the technology directly from Caltech or indirectly through Photobit. And of course, APS was named by Tsutomu Nakamura of Olympus, and "3T APS" imagers (as they are now called) were around since the late 60's. What we claimed for inventions are spelled out in the claims of the actual issued patents but this would be way too much detail for this video. At the time, in the early 1990's, CCDs were the indisputable king of imaging technology. The power dissipation of CCDs and associated electronics were enormous, and for space missions, CCD cameras were very bulky, power hungry, and prone to all kinds of failures. But their performance was/is extraordinary. Our goal was to come up with a miniaturized scientific-quality image sensor technology that would maintain the performance but allow miniaturization. 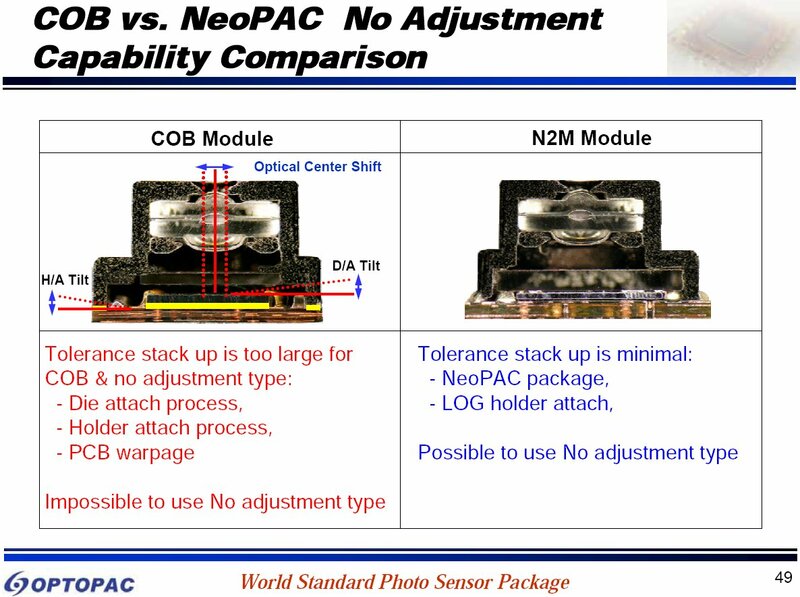 At that time, almost everyone (and I refer to the establishment of CCD guys) thought putting an ADC on chip was a BAD idea, much less integrating timing and control circuits, drivers, or digital processing. So, a CMOS based camera-on-a-chip (meaning camera electronics) was a radical idea. I did not know at that time of the notable work going on in Edinburgh or Sweden - but those efforts were definitely not geared towards image quality - they were geared towards low cost and minimal imaging quality (and in Linkoping, speed). They all used what I subsequently termed passive pixels to distinquish them from APS. (This was also what VVL and Omnivision used when they went into business. The Edinburgh and Linkoping teams definitely were part of making this whole camera-on-a-chip technology become ubiquitous today. Anyway, after showing promising performance with intra-pixel charge transfer APS (first with MOS photogate and then JFET photogate (Pinned PD) with Kodak under tech transfer agreement) we launched Photobit because industry was moving at the speed of a snail. We also found that 3T APS worked pretty well for webcams and other applications and dropped the photogate approach for a few years until we could find someone who would make it in a timely way (Photobit continued to work with Kodak but that was sooo slow that it was dead before you knew it). Albert Theuwissen continues PTC article series, with recent post starting to discuss various effects of light. The previous articles mailny dealt with effects in the dark. 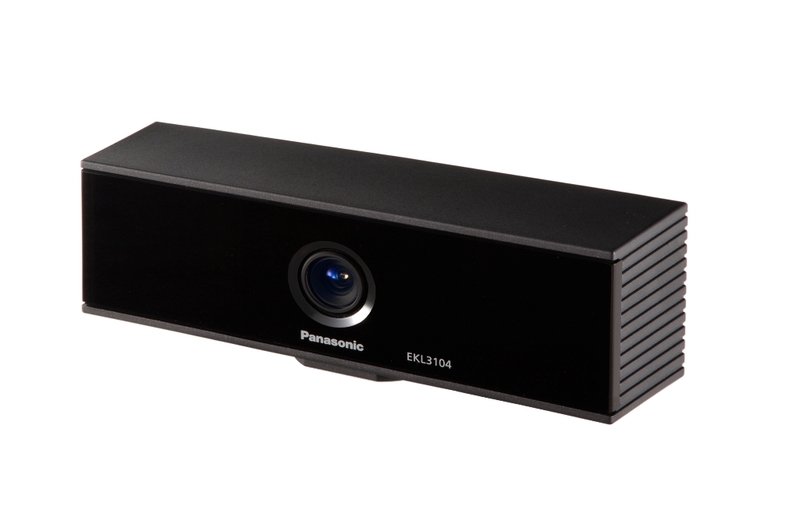 Business Wire: Panasonic announced the release of its new time-of-flight 3D image sensor, the D-IMager. The sensor is aimed at various gesture control applications, such as out-of-home entertainment, immersive multi-media, interactive digital signage and video arcade games. Panasonic has a web site devoted to the new D-IMager, including a video with many ideas for 3D sensor applications. One thing I like about D-Imager is that Panasonic is quite open in publishing its spec. The sensor is capable of resolving 160x120 pixels at 20 fps (standard mode) or 30 fps (optional) and is available with a USB2.0 interface. Its viewing angle is 60deg horizontally and 44deg vertically. Its range is from 1.2m to 9m. The sensor is said to be able to work in wide range of lighting conditions, including outdoor at less than 20,000Lux. The depth resolution is from 3cm (max) at 0Lux illumination to 14cm at 20,000Lux. The power is supplied from 18V DC supply with 0.4A avarage current consumption.